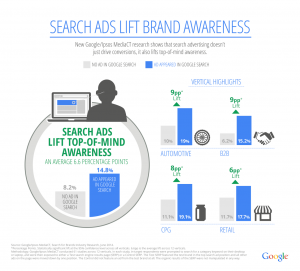 Can Paid Search Ads Improve Brand Awareness? Posted June 20, 2014 by Kurt Henninger . Google recently came out with the results from a study they conducted with Ipsos MediaCT in 2013 around branding and addressed the question of whether or not paid search ads improve brand awareness. The results of the study really confirm what a lot of us in the internet marketing field have been saying for years, that PPC and even Google Search ads can and do increase Brand awareness as well as direct conversions for a site owner. The study itself was a “meta-study” combining over 61 studies covering 12 different business verticals. The Search Engine test showed both what is known as a “Control” (which did not show the Test brands PPC Ad) and then one where their brand was shown prominently at the top of the Search Engine Results. See the image below for an example of the two tests. The results themselves are pretty startling, as showing a Google Search Ad improved top of mind awareness and brand recall by 80% for those running those ads. The results themselves You can see the summary of the results in the image below with some sample breakouts by vertical. For the most part, when people think of Google Adwords, they think of direct response marketing. i.e. clicks turning into either calls or viewers landing on your website and hopefully fill out out a contact form, subscribing to your newsletter, or filling out an assessment form. Most people think of traditional brand awareness campaigns as limited to TV, radio, or print ads, but this study shows that this is not necessarily the case. However, the study seems to indicate that this is not necessarily the case. #1 First, you should be aware of what kind of KPI (Key Performance Indicators) that whoever is running your PPC campaigns is running for you. Are they trying to increase branding (top of mind awareness) or directly impact some type of conversion (Calls to your business, appointment forms being filled out, etc). You can run BOTH a direct response AND/OR branding specific campaigns for any kind of business, whether it is a brick and mortar auto rep. 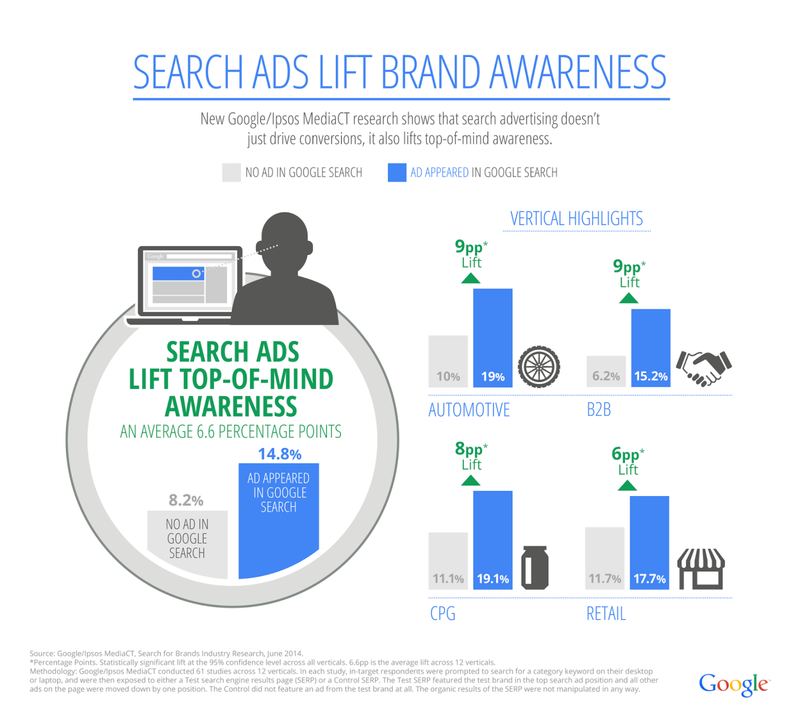 But, like the study shows, direct response PPC campaigns do increase top of mind awareness. #2 For small to medium sized businesses, we recommend a direct response PPC campaign first, with possible branding afterwards down the road. As you can see from the study, Google Search PPC campaigns do have a brand awareness lift, but this should be viewed a secondary affect, not the first primary purpose of these kinds of campaigns (unless you specifically designate so). What do you think about this? Have you noticed this trend before? Great post! I run our own PPC campaign for our single location transmission & drivetrain only transmission repair shop in SLC, Utah. Our KPI is a phone call. Manually tracking this KPI doesn’t work; we have to have an automated system like call tracking. Soon, we learned even that wasn’t enough, so we switched call tracking companies to one that had keyword level call tracking so we could see what keywords were driving the higher quality phone leads and what keyword were driving the the lower quality phone leads. With clicks averaging $10-$11 each to maintain our top spot position, I didn’t see any use to bid on keywords that had developed a track record of consistently driving poor quality phone leads. As far as brand awareness goes, I have no data on that. Our business is akin to a funeral home. You don’t need us till you need us. Because we don’t do general repair, our name does not show up on a SERP for any kind of automotive repair unless it’s related to transmission repair. I have carefully tracked, experimented, and tried various different methods and strategies over the years with varying degrees of success and our current configuration seems to be working the best. The caveat is that once you get all the search engines tuned in and humming, you build your business around that level of business. If, for whatever reason, you loose your search engines, your business drops so dramatically that you’re going to have to lay people off and scale your operation back dramatically as well. Our current expenditure with search engine PPC is in the high 4-figure range and if it continues to grow as it has over the past 5 years, we will be in the 5-figure numbers in a few short years. What do you do? You have to have it. I tried scaling back, and it about killed us, so I went back to our current configuration. Maybe that’s why we’re the busiest transmission shop in Salt Lake City. Larry, thanks for stopping by and commenting. You are right about if your KPI is phone calls, you do need some a call tracking solution that integrates keyword level call tracking data into both Analytics and Adwords. Manually just doesn’t cut it as you really need the granular level of detail through keyword level conversion data (in this case calls) to really know what is driving calls and more importantly high quality phone calls. Really the next step for you and what it seems you may need to do is determine how much you are willing to pay for those high quality phone calls (also known as Cost Per Acquisition). From there, you can really determine what kinds of bids you should be placing on each converting keyword. Hello Keith, thanks for raising a very interesting point. rates low and improve what analytics we can. integrating PPC into a proper customer journey / marketing strategy. Thanks for coming by and commenting. I would differ with you on your opinion the availability of data on the quality of traffic from Adwords. Generally speaking Adwords traffic, if targeted correctly, is some of the highest quality traffic available online. There are thousands of companies that buy Adwords traffic and generate leads or sale from it day-in and day-out. Google itself is a multi-billion dollar a year company with their revenue primarily derived from serving ads for people and companies. ads for people and companies.